FILE - Sigmar Gabriel speaks during a press conference in Berlin, Nov. 4, 2015. The British people on Friday voted by a narrow margin to break away from the European Union, a move that some European leaders are labeling a grave mistake. NATO Secretary-General Jens Stoltenberg said he knows Britain "will remain a strong and committed NATO ally, and will continue to play its leading role" in the alliance, which he said in a statement "remains committed to closer cooperation with the European Union." “Europe will continue but it must react and rediscover the confidence of its peoples. It’s urgent,” Ayrault said. More than 70 percent of registered voters participated in the referendum, which passed by a margin of nearly four percent. The referendum was seen by many “Leave” supporters as reflecting British sentiment on immigration, sovereignty, security and Britain’s economic future. 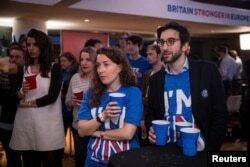 Supporters of the Stronger In Campaign react as results of the EU referendum are announced at the Royal Festival Hall, in London, Britain, June 24, 2016. "We have fought against the multinationals, we have fought against the big merchant banks, we've fought against big politics, we've fought against lies, corruption and deceit. And today, honesty, decency and belief in nation, I think now, is going to win," Nigel Farage, the leader of the UK Independence Party, told a group of supporters following the vote. “As I have been asking for years we must now have the same referendum in France and EU countries,” the National Front leader said on Twitter. Dutch Freedom Party leader Geert Wilders called for the Netherlands to hold a referendum on its EU membership shortly after news broke of the results. Wilders, who is currently leading in opinion polls, said if he is elected prime minister in the country’s March general election, he will call for a referendum. A survey conducted this week in the Netherlands by the Een Vandaag television channel showed the 54 percent of Dutch people are in favor of a referendum. In an effort to stem the tide of other European countries that may want cut ties with the union, EU Parliament President Martin Schulz said he will speak with German Chancellor Angela Merkel on “how we can avoid a chain reaction” of other countries choosing to leave. "The chain reaction that is being celebrated everywhere now by euroskeptics won't happen," he said.